Play Me, I'm Yours, an international touring art project that has been produced in 50 cities worldwide, comes to Arizona for the first time. Touring since 2008, the project has reached over ten million people worldwide; over 1,500 pianos have been transformed into works of art. The free exhibition of pianos is intended to invite and encourage public engagement through art, performance and music, 24 hours per day, seven days per week, during the dates of the run of the show. Various events have taken place and will take place going forward in conjunction with the project that will raise money for programs that encourage youth art experiences in our communities. All the pianos on display were donated. Each of the piano designs is unique; even if you have seen Play Me, I'm Yours in another city, you won't see any 'repeat' pianos. In the photo above, the lead artist for the piano on the left is Lauren Lee. The local community group that worked on the piano is Boys and Girls Club, Grant Woods Branch. You can see that piano, up close and personal, at Mesa-Gateway Airport. The lead artist for the piano on the right is William Barnhart. The local community group that worked on the piano is Mesa Contemporary Arts Museum Docents. That piano has been placed at Mesa Community College. Groups involved in transforming a piano for the project include several Mesa public schools, Boys and Girls Club of the East Valley – Mesa Arts Academy, Community Asset and Resource Enterprise (CARE) Partnership, The Chinese Community, Eastmark, East Valley Institute of Technology, Mesa Association of Hispanic Citizens, A New Leaf, Mesa Contemporary Arts Museum Docents, Mesa Urban Garden, New School for the Arts, Oakwood Creative Care, Phonetic Spit, Southwest Maker Fest, Creative Catalysts and First United Church of Mesa. Are the pianos real? Can you play them? Yes, they are real, and yes, please do play them! Each city hosting the pianos has a website established where people can post their photos and share their thoughts, experiences and inspirations evoked by the pianos. You can post your images and comments at the Mesa website for Play Me, I'm Yours . Where: Downtown Mesa along Main Street, near Mesa museums and libraries, on Mesa Arts Center’s campus and at numerous other accessible and open-to-the-public locations, including several satellite locations throughout Mesa. 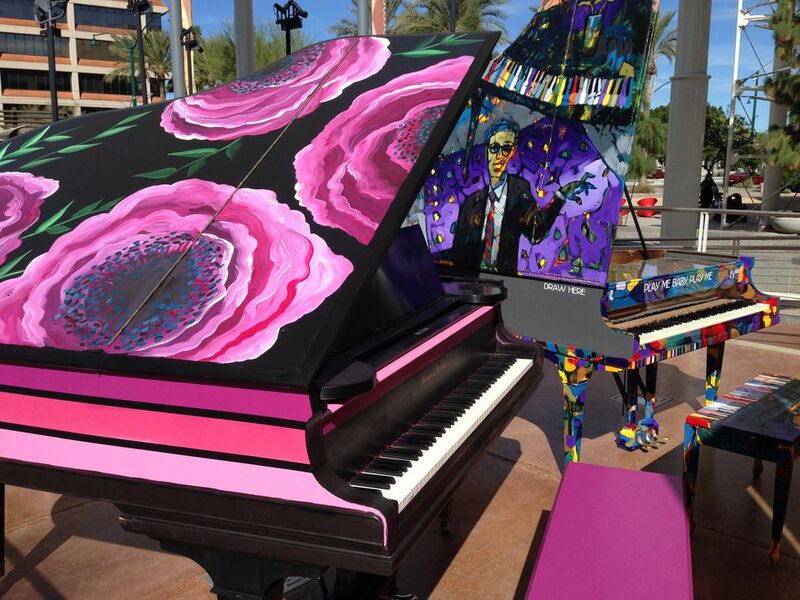 You'll find 16 of the pianos within walking distance of each other in Downtown Mesa, walkable from the METRO Light Rail line (Main Street / Mesa Drive Station) on Mesa's Main Street. On your way to Downtown Mesa, or on your way back, you'll find a piano at the East Valley Institute of Technology (Main Street / Sycamore Station). Going to see a Chicago Cubs game at Sloan Park or an Oakland Athletics game at Hohokam during Spring Training? You'll find a piano from the exhibition adjacent to each of those stadiums. Mesa Community College hosts a piano. There are three pianos in East Mesa, at the Red Mountain Multi-Generational Center, Eastmark, and Phoenix-Mesa Gateway Airport. Have you been counting? Wait -- that's only 23 pianos. Where is the 24th? It's going to be mobile, so you'll have to find it! Check out this Twitter page to see where the rogue piano will be next! You can see a map of all the piano locations here. Why Mesa: To celebrate Mesa Art Center's 10 year anniversary in Downtown Mesa. How much: Nothing! The pianos are on display for you to enjoy. If you haven't been to Mesa in a while, you'll be surprised at all that's going on there! Map: This map to downtown Mesa will help you get started. Parking: Free parking is available in the neighborhoods and on the streets.